The Shiloh/Double Branches Cemetery lies in the extreme eastern end of Wayne County, Tennessee in the West Point Quadrangle. The cemetery is still occasionally used for new burials. Approximately 100 yards past the cemetery is the Double Branch School building that was once used as a polling place. The building also has the appearance of being a church at some point in time. 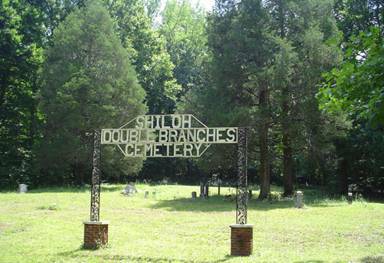 To reach the Shiloh/Double Branches Cemetery, from the Westpoint TN area, turn off of Wayland Springs Rd. #242 west of Westpoint onto Collinwood Road #912. Collinwood Rd. will become California Branch Rd. upon entering Wayne County. Travel 3.8 miles after turning off Wayland Springs Rd. and turn right onto Factory Creek Rd. Continue 1.8 miles on Factory Creek Rd. after crossing the Douglas McGee Memorial Bridge and turn left onto Shawnettee/Factory Creek Rd., a dirt road. Travel on Shawnette/Factory Creek Rd. a distance of .2 miles, crossing the John Dixon Memorial Bridge. After crossing the bridge, turn right and continue following the Factory Creek Rd. for a distance of .7 miles. Turn left onto Double Branch Rd. and travel .6 miles and turning sharp left onto a narrow dirt road, go approximately .1 mile crossing a branch or creek. The cemetery is on the left of the road. Alternate Route: From Collinwood, Tennessee, travel east on Railroad Bed Rd. from the Natchez Trace overpass 1.4 miles and turn left onto Shawnettee Rd. Go about .3 miles and turn right onto Big Shawnettee Rd. Travel approximately 7 miles and turn left onto Factory Creek Rd. a dirt road. Follow Factory Creek Rd. for a distance of .7 miles. Turn left onto Double Branch Rd. and travel .6 miles and turning sharp left onto a narrow dirt road, go approximately .1 mile crossing a branch or creek. The cemetery is on the left of the road. Dixon, Mary J. (McGee); b. 17 Mar 1848, d. 23 Oct 1936, wife of Jonathan M.
Gallaher, Susannah; b. 14 Jun 1855, d. 14 Aug 1885, wife of J.W. Hollis, Martha Elizabeth; b. 05 Jun 1893, d. 23 Aug 1905, daughter of R.M. & R.A.
McGee, A.S.; b. 04 Mar 1861, d. 15 Sep 1882, daughter of L. & M.
McGee, LeRoy S.; b. 26 Jun 1867, d. 14 Sep 1889, son of L. & M.
Prince, Laborn; d. 15 Feb 1894, husband of M.J., Co. “K” 45th Ohio Inf.